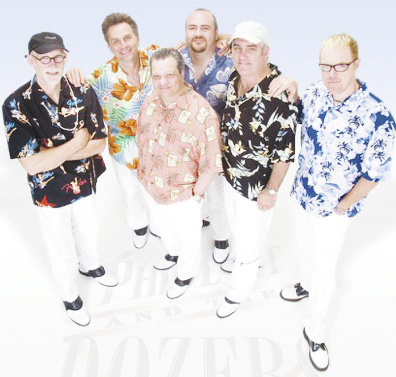 Phil Dirt and the Dozers will provide pre-fireworks entertainment at 7 p.m. July 4 at Grimes Field. The performance is part of the Champaign County Arts Council’s Concerts in the Park series – free music throughout the summer. Airport visitors are invited to bring lawn chairs or other seating. If rainy weather intrudes, the concert will move inside a hangar. America’s premiere “Rock ‘N R’oldies” review (and the most popular vintage rock and roll show in the nation) will help you recapture those wonderful days. With their musical talent, high energy and contagious sense of humor, Phil Dirt & The Dozers will transport you to another time and place, the ’50s, ’60s and ’70s of Rock and Roll. Imagine hearing The Four Seasons’ Sherry with the original falsetto vocals intact or the hauntingly beautiful Righteous Brothers’ Unchained Melody or their You’ve Lost That Lovin’ Feeling or the beautiful ballads of Roy Orbison including Pretty Woman and In Dreams. Party on the beach with The Beach Boys and Jan and Dean. And, imagine the Platters’ soul-stirring Only You performed with all the scratches and skips found on a well-worn 33 1/3 record, the way The Dozers first learned it. The Phil Dirt Time Machine also stops in the ‘70s, where you’ll experience some of this decade’s greatest hits including those from the Doobie Brothers, Grand Funk Railroad, The Eagles and even the O’Jays.